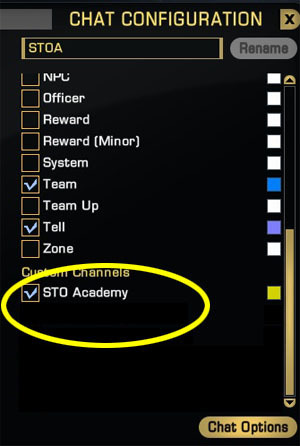 The STO Academy uses a private chat channel so members of all our fleets can chat together with any of their characters. Since it is private you'll need an invitation. You can get an invite by contacting [email protected]_stoa or one of the other Admirals listed on the Ranks & Leaders page. 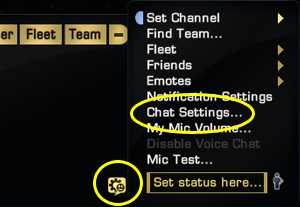 After you have been invited, click the icon in the bottom right corner of the chat box to access the Chat Settings. Click the Channels tab at the top. 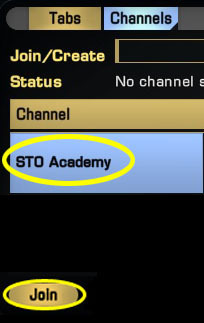 You should see the STO Academy listed. Click on each and then click the Join button at the bottom. If you don't see them listed then you'll need an invite so go back to Step 1. Click on Tabs at the top. You'll see STO Academy listed here. You can add the channel to any of your chat tabs and customize the color.